This summer Ibiza enters an exciting new chapter with the launch of Hï Ibiza, the brand new superclub by Ushuaïa Entertainment. The club, formerly known as Space, will have a fresh new look and aims to have the most advanced sound and technologies on the island. From May through September the venue will play host to possibly some of the finest selectors from the global electronic music scene, including many of Ibiza’s popular DJs. The club recently revealed its new additions for its Opening Party. 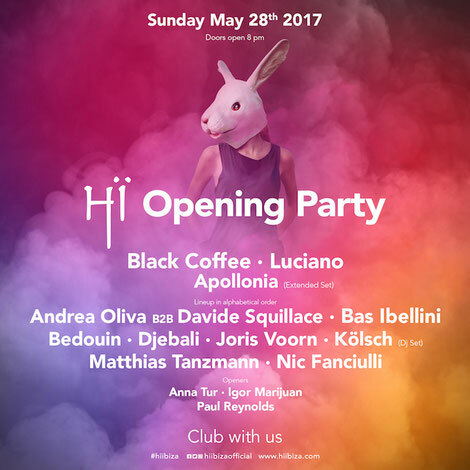 On Sunday 28 May Hï Ibiza opens its doors for the very first time, where you can see the newly transformed club and a cast of DJs including Apollonia, Black Coffee, Kölsch, Luciano, Nic Fanciulli and more making their own piece of Ibiza history with their debut. Joining the lineup today is Bedouin, the Brooklyn-based duo of Rami Abousabe and Tamer Malki who have made a name for themselves performing at festivals like Burning Man, with their hypnotic, dreamy melodies and driving rhythms that carry heavy influence from their Middle Eastern heritage. Ibiza Global Radio DJ Anna Tur, Ibiza Sonica tastemaker Igor Marijuan and Ushuaïa regular Paul Reynolds also join the bill. The newly announced acts join a selection of DJs at the Opening Party, including possibly the biggest breakthrough star on the island in recent years, Black Coffee. This will mark the first of many appearances for the South African DJ and producer who begins his first ever Ibiza residency at Hï Ibiza this summer. Luciano also stars, possibly one of the key architects of the modern Ibiza scene. The opening party will also play host to an extended set from Apollonia a.k.a. Shonky, Dan Ghenacia and Dyed Soundorom. Saved Records boss Nic Fanciulli and Dutchman Joris Voorn join the bill, along with a DJ set from Danish DJ-producer Kölsch, and Italian stalwarts Andrea Oliva and Davide Squillace, who step up for a special back-to-back session. Finally, Moon Harbour founder Matthias Tanzmann, London producer Bas Ibellini and Parisian DJ Djebali also play.